ST. GEORGE — An earthquake shook a remote area near Glenn Canyon National Recreation Area Saturday morning . 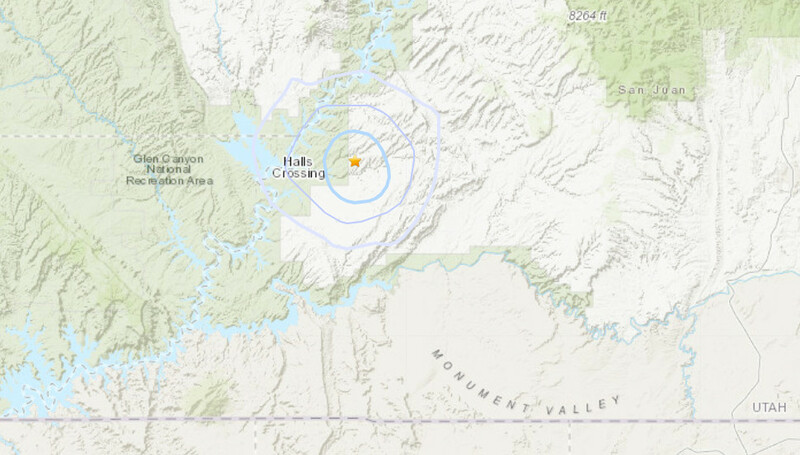 The University of Utah Seismograph Stations reported the quake at approximately 4:30 a.m. in southeastern Utah about 10 miles east of Halls Crossing on Lake Powell. The epicenter of the quake occurred in an uninhabited area, measuring 3.4 magnitude on the Richter scale, according to the U.S. Geological Survey. The quake wasn’t powerful enough to cause much in the way of damage but was strong enough for someone to have felt shaking, according to seismograph stations’ measurements. Seismic activity and earthquakes are not uncommon in Utah. The USGS reported several smaller earthquakes in the Southern Utah area within the last week, including a 2.5 magnitude quake that struck west of Enterprise along the Utah-Nevada border Saturday afternoon.